4 Way Slide Type - DIP Switch Overview: This DIP switch is designed to be used on a printed ci..
Elcom - Key Lock Switch 1/3 Overview: High quality, flat key switch. 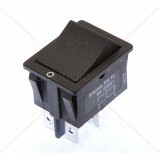 Good switch f..
Elcom - Key Lock Switch 5A Overview: High quality, flat key switch. Good switch for Pre Amp, P..
Elcom - Rotary Switch 1 Pole 12 Way Non-Shorting Overview This 1 pole 12 way non-shorting rota..
Elcom - Rotary Switch 3 Pole 4 Way Non-Shorting Overview: This 3 pole 4 way non-shorting rotar..
Elcom - RSF11 - Rocker Switch - Red Specifications: Type: SPST, Non-Illuminate..
Elcom-Rocker Switch-(RS-16) 16A Specification: Type: Non-Illuminated Mounting..
Elcom-Rocker Switch-(RS-16) 6A Specification: Type: Non-Illuminated Mounting: ..
Rotary Switch 4 Pole 3 Way Non-Shorting Overview This 4 pole 3 way non-shorting rotary switch ..